A few months back, I was pitched over Skype by the CEO and co-founder of a startup building a platform that was going to realise the “true potential” of science. “Not yet but I still think TechCrunch readers will want to hear about us,” he replied, before proceeding to tell me how to do my job. “Don’t count on it,” said the overly confident CEO. 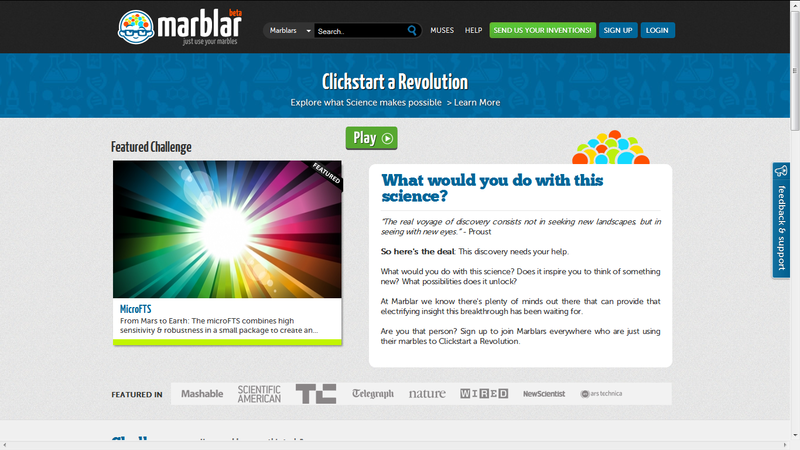 That startup was Marblar, which today sees its public launch with a platform that — with the help of the crowd — aims to find commercial uses for the thousands of scientific discoveries otherwise laying dormant in universities around the globe. And in doing so, may actually have the potential to not just change science but (indirectly) change the world. Specifically, the problem that Marblar is trying to solve is that all too often, the authors of scientific discoveries and inventions simply don’t know what practical uses, if any, their breakthroughs might have. As a result, universities have a pretty poor track record of commercialising their research (research that is largely funded by the taxpayer). But by setting more eyes on the problem, in a way that encourages lateral thinking, greater creativity, and a coming together of people with different disciplines, Marblar thinks it can change that. “Talk to any scientist and they’ll tell you they really only read papers in their own field, do keyword searches, but to actually stumble upon a novel piece of research in a completely different field that solves your problem, that just rarely ever happens”, explains Marblar’s CEO, Dan Perez, when we finally meet over coffee in London’s West End. And he and his other co-founders — Mehmet Fidanboylu, Gabriel Mecklenburg and Tom von Erlach — should know. In their mid-to-late-20s, each are Ph.D science students at Oxford University, King’s College, and Imperial College, respectively. Their disciplines span biochemistry, neuroscience, materials science, and regenerative medicine. The overriding ambition of Marblar is to create a platform that will “make lightning strike more often.” The kind of lightning that has historically seen inventions, such as a new temporary glue give rise to the Post-it Note. Or something as revolutionary as the printed press, which combined lessons from the coin press and the controlled pressure used in making wine. These are just two examples that Perez likes to tell with infectious — bordering on slightly irritating — enthusiasm. Nonetheless, the pitch is compelling. The way Marblar hopes to engineer this type of serendipity is deceptively simple: The authors of un-commercialised discoveries work with the Marblar team to post a listing of their invention — distilled in an accessible, yet comprehensive form — from which the crowd are tasked with drilling further into its capabilities and, in contest form, enter ideas for possible commercial uses. Each ‘entry’ is then voted upon by the Marblar community, while there’s a wiki-like Q&A section so that users can interact with and bounce ideas off of the invention’s author. There’s also a heavy dose of gamification, users earn points — marbles — and trophies for their participation. The eventual winner, as decided by the IP holder, receives a small cash prize, too, though Perez doesn’t think this is the most important incentive. Instead, it’s the intellectual curiosity itself and the chance to be recognised by the wider scientific and academic community that, in Marblar’s closed beta test, proved to be the biggest draw. And it’s certainly true that kudos and recognition is the main currency in academia. Perez also says that for the ‘winner,’ there’s the potential to stay involved in the subsequent commercial exploration of said invention and maybe even land a job. “They can show prospective employers they’re thinking creatively around science and innovation,” he says. Perhaps controversially, however, Marblar, and its contract with the university ‘tech transfer’ departments that it’s partnering with, doesn’t offer anything in the way of royalties to the winning entrant if a product does make it to market. That probably won’t pose a problem at launch, but I can see it potentially causing some bad PR further down the road should the platform really take off. On the other hand, for the time being at least, Marblar doesn’t take a cut, either, and instead makes its money by charging a fee for the listings themselves. In the future, however, it’s not hard to see how that could change, and Perez hints as much. All of which hasn’t gone unnoticed by the wider R&D industry. One of the participants in Marblar’s trial run, IP Group PLC, has since gone on to become a strategic investor, putting £373K (appox. US$600K) into the young startup. In addition, the law firm, Bird and Bird, and the Royal Society of Chemistry, have agreed to sponsor 6 Marblar competitions each, providing another early revenue stream for the young company. And Marblar boasts an impressive advisory board, too, spanning heavyweights from the scientific world, along with an executive from the ad agency Saatchi & Saatchi, whose London office is just around the corner from the coffee shop we’re in. Finally, after taking in an hour-and-a-half long pitch, scrutinising every slide in Marblar’s deck, which Perez insists I see, we draw our coffee to a close, to the relief of myself and, I suspect, Perez’s co-founders. Before I make motion to leave, however, I ask if there can possibly be anything that I’ve missed. And at the risk of letting the Marblar CEO tell me how to do my job again, I think I just did.